Kyoritsu range of Insulation Testers features more than 20 diverse models, with test voltages ranging from 15V to 12KV, and analogue or digital indicators. Kyoritsu, Japan has a frontline global presence in electrical test and measurement equipment since 1940, with specialised expertise in low voltage test and measurement. In India, the company has been present for many decades already, offering world-class products optimised for Indian needs at ‘just right prices’. Many of these products have for long been the choice equipment of Indian electrical installation professionals. Kyoritsu range of Insulation Testers features more than 20 diverse models, with test voltages ranging from 15V to 12KV, and analogue or digital indicators. Battery-powered, compact and user-friendly, each and every product is an industry standard today. Kyoritsu’s 3128 is Defacto Standard in 12KV Insulation Testing in this part of the World. The company’s endeavour is to provide the best in testing of insulation resistance with 6 test range. Suitable for analysing the insulation characteristics of cables, transformers, motors, generators, high-pressure switches, insulators, wiring installations, etc. 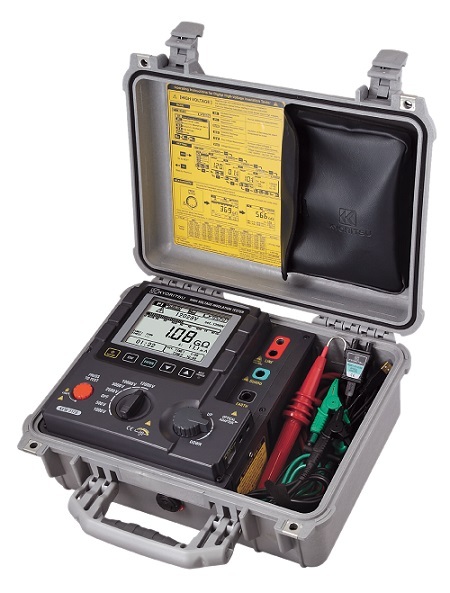 Diagnosis insulation tester offer like PI, DAR, DD & SV. Capacitance Measuring range: 5.0nF ~ 50.0µF. Auto power off available, Low battery warning indicate. Safety standard IEC 61010-1 CAT IV 600V Pollution degree 2, IEC 61010-031, IEC 61326, IEC 60529. Kyoritsu products are readily available in India and have complete service- and calibration- support set-up too.